A 26yr old male was on his way back from work when his motorbike collided with a vehicle traveling in the opposite direction. The impact of the collision split his helmet, as he was thrown towards the edge of the road.Motorists and pedestrians rushed to his aid and took him to a near by hospital. Due to lack of medical infrastructure and expertise to treat the trauma, he was shifted to SL Raheja Hospital – A Fortis Associate, where Trauma Specialists at the Emergency Dept. quickly took charge. It was established that the patient had sustained severe Maxillofacial Trauma, his mid-face was completely shattered. It was reported upon arrival that the patient was bleeding from his nose and mouth, his upper jaw was hanging; after thorough evaluation, internal injuries were ruled out. The patient had suffered facial injuries and slight loss of memory, post the accident. A team of multi-disciplinary doctors including Intensivists(Dr Sanjith Saseedharan), Anesthesiologist (Dr Prakash Ambardekar), Neurologists, Chest Physicians (Dr Vaibhav Kubal & Dr Ucchil), ENT Specialists (Dr CG Bhave)and nurses came together to treat the patient; the patient was immediately shifted to the Operation Theater, to stabilize his jaws and to stop the bleeding. The patient had suffered considerable blood loss. To sustain the airway, surgeons evaluated on performing a Tracheostomy; this consists of an incision in the front of the neck to directly open an airway. The patient was anesthetized and a tube was put through his nose that secured his airway. 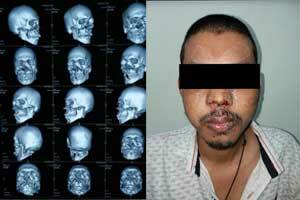 The surgical procedure and further treatment were conducted by Dr. Samrat Tawde, Consultant Oral and Maxillofacial Surgery, S.L Raheja Hospital – A Fortis Associate. As the patient was stabilized, Dr Tawde evaluated the patient’s face thoroughly, to understand the possible bleeding points. It was noted that the lower jaw (Mandible) was broken, the upper jaw (Maxilla)and palate was broken in four pieces; it had dislodged outward and were barely held by soft tissues inside the mouth. His nose along with the adjoining areas of his face was also shattered. Speaking about the procedure, Dr Samrat Tawde, said, “After we stabilized the patient, we sutured all lacerations and managed to get the bleeding under control. The nose was packed with gauze and a urinary catheter was used as a balloon to stop the bleeding and pull the maxilla ahead. His condition was stable and we were happy with the outcome; he was later moved to the ICU for observation”. Post-op, the patient was observed for a few days to ensure that the brain or other organs hadn’t sustained injuries or infections. Post-observation, Dr Tawde proceeded to conduct a surgery known as ‘Submental Intubation’, marking the first of its kind at the hospital. Usually putting the patient under anesthesia involves inserting the tube through the throat or the nose. However, due to the extent of injuries, this maneuver would have obstructed the surgery. The next best option was to conduct a tracheostomy that involves cutting through the windpipe and inserting the tube directly into the throat. This procedure is often fraught with risks such as loss of voice and severe scarring of the windpipe and prolonged hospital stay. The team of doctors sought an innovative airway management procedure. The team did a Submental Intubation – that is access to the airway or the windpipe by cutting under the chin and pulling the anesthetic tube through the submental or the chin region. This relatively is a scarless procedure with minimum risk. Following the submental intubation, the definitive surgery started. An Inter-Maxillary Fixation, which involves fixing wires around the teeth, was put in place to hold the jaws together. An incision was made inside the gums in the lower jaw, which had a Y-shaped of fractured, to insert titanium plates to hold the bones together. Securing the upper jaw was a huge task as it had been broken in four pieces. 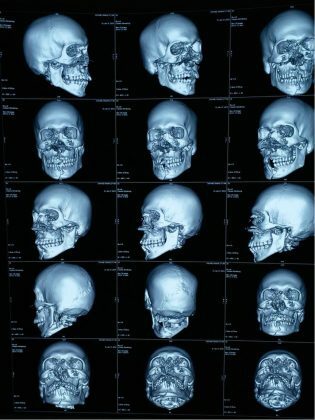 After identifying the pieces and distinguishing the fracture of the nose, surgeons evaluated each side to identify stable and non-stable points. The cheek bone formed the main stable point by which the surgeons were able to re-arrange the bones. The face had caved-in at the nose, the maxilla was rearranged outward, plates implanted across the upper jaw with elastic bands, to hold them together. An external nasal fracture repair was conducted, a stent was inserted to allow the area to rest and heal. Talking about the success of the surgery, Dr Tawde adds, “The case was very complex, we were not certain of the gravity of injuries and how many pieces the bones had broken into. Luckily for the patient, he had not sustained any Brain damage or internal injuries; wearing a helmet saved his life. Without timely intervention, the patient would have died of extreme bleeding and suffocation. Post-op, he has been sent home is being looked-after by his family. His face will look normal; albeit there could be residual deformities which if required can be addressed later.We have advised him to come for regular follow-ups to ensure everything is in place as well as a psychiatric analysis. He should be able to resume his daily routine between 30-45 days”.